This mid-infrared composite image was obtained with the Gemini North telescope on Mauna Kea, Hawai'i, on 22 July at ~13:30 UT with the MICHELLE mid-infrared spectrograph/imager. 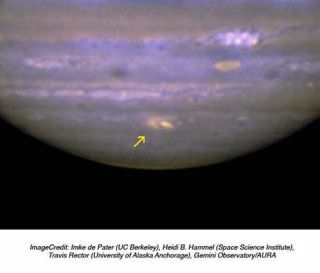 The impact site is the bright yellow spot at the center bottom of Jupiter's disk. NASA needsmore cash in order to meet its goal of finding nearby space rocks that couldhit Earth in a devastating impact, a new report says. Congressordered NASA in 2005 to find and track 90 percent of the largeasteroids near Earth by 2020, but did not set aside the necessary fundsrequired to do the job, according to a report released Wednesday by theNational Academy of Sciences. Withoutthat funding, NASA will not be able to build the new facilities and telescopes requiredto track potentially threatening asteroids down to the size of about 460 feet(140 meters) across, according to the interim report. ?I thinkthey?re pretty much right on,? said Lindley Johnson, NASA?s manager of theNear-Earth Objects program at the agency?s headquarters in Washington. Johnson toldSPACE.com Wednesday that NASA has estimated it needs between $800million and $1 billion over the course of 12 to 15 years to build and supportthe more sensitive telescopes required to meet its goal of tracking most of thenear-Earth objects. AstronomerDonald Yeomans, manager of NASA's Near-Earth Object program office at the JetPropulsion Laboratory in Pasadena, Calif., has said that about 15 percent ofthe objects 460 feetwide and larger have been found, and only 5 percent of objects down to about 164feet (50 meters) in size. One of thetop space rocks under observation is 2007 VK184, a 425-foot-wide(130 meters) asteroid that has a 1-in-2,940 chance of hitting Earth sometimebetween 2048 and 2057. An impact, if it occurred, would cause an explosionroughly equivalent to 150 million tons of TNT, or more than 10,000 times thatof the atom bomb droppedon Hiroshima. NASA isjust about 85 percent complete with tracking asteroids about a half-mile (1 km)in size, Johnson said. Scientistsestimate there are about 100,000 asteroids and comets near Earth, but onlyabout 20,000 are expected to pose any risk of impact. As of Monday, NASA hasfound 6,330 of those objects, 1,000 of them flying in orbits that could potentiallythreaten the Earth in the future, Johnson said. Aside fromefforts to launch space-based missions to track incoming asteroids by Germanyand Canada, the United States is carrying the bulk of the asteroid watch work,the new report stated. NASA currently has three separate search teams runningfive different telescopes to hunt for potentially threatening objects nearEarth. The recent impacton Jupiter last month of a previously unknown object has brought Earth?s riskof a similar hit back to the forefront. If such an impact occurred on Earth, theresults wouldbe catastrophic, scientists have said. ?It caughtus a little bit by surprise,? Johnson said of the Jupiter impact, whichscientists believe was caused by an asteroid or comet. Johnsonsaid that scientists plan to use data from NASA?s new Wide-field Infrared Survey Explorerspacecraft, which is slated to launch in late 2009 to map the night sky in moredetail than ever before, to expand their search for near-Earth objects. He andhis team are looking forward to the final version of the National Academy ofSciences report. A finalversion of the report is slated to be completed by the end of the year. In themeantime, NASA recently launched a new ?Asteroid Watch? Web site (http://www.jpl.nasa.gov/asteroidwatch/)to keep the public current on its work to track near-Earth objects. The Website launched July 29 to post updates and alert the public to new research andfindings via updates, Twitter and an asteroid tracking widget. Johnsonsaid the Web site was in development long before the Jupiterimpact, which occurred just over a week earlier. ?We hadactually started work to bring up that Web site a couple of months ago,? Johnsonsaid. ?That was just another event out of the blue. ?